Perfect for your saddlebags or coffee table. 8 1/2″ x 11″ softback, 208 pages,with over 50 photographs, and illustrations by Bob Moline and Walt LaRue. The book includes lyrics, music transcription, and tablature. This is a collection of great western classics. “The songs contained in this book are songs I’ve spent some forty years singing, playing, collecting and hopefully in some way, preserving. From cow camps to trail towns to the music halls of the world, most of these songs have been sung and played by countless cowboy troubadours for over a century and a half and are as good today as they were then. 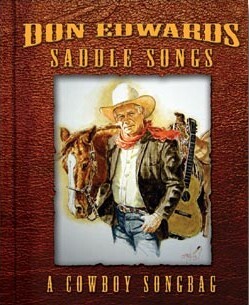 In this humble collection you’ll find classic old-time cowboy songs, some by famous cowboy writers and even a few I wrote myself.